In 1974, the world gemstone market was introduced to a blue form of pectolite, a gemstone variety of this hard, white mineral with a vitreous luster, found in hydrothermal pockets, and associated with metamorphic rock formations. Blue pectolite is of volcanic origin and is found only in a mountainous, relatively inaccessible region of the Dominican Republic overlooking the Caribbean Sea. Larimar works to open and equilibrate the upper chakras, helping the individual get in touch with their own inner truth, enhancing the ability to communicate that inner truth to others. 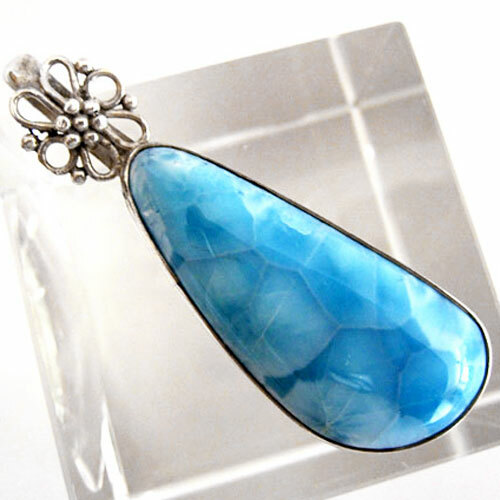 Read more about Larimar in our Crystalpedia.